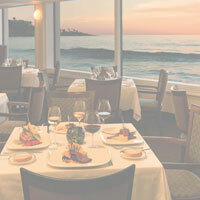 Enjoy an elegant fine dining experience at our La Jolla restaurant on the water featuring locally sourced seafood cuisine paired with unrivaled high tide views. From fresh seafood to innovative seasonal dishes, The Marine Room is one of San Diego's best restaurants and one of the region's most iconic dining destinations. Utilizing San Diego's bounty, feast on local seafood classics, innovative marine cuisine, and small plates at our elegant La Jolla restaurant on the beach. Join us for special menu events like High Tide Breakfast and Lobster Night. Enjoy fine dining featuring creatively prepared seafood dishes with unparalleled ocean views for dinner and celebrations at our La Jolla Beach restaurant. Let the culinary artistry of Executive Chef Bernard Guillas take you on a global journey that will excite the senses. Offering custom menus, an elegant ambiance, and ocean views, host your upcoming celebration or special event at our oceanfront event venue in La Jolla, CA. Whether it is a business gathering, family milestone, wedding, or just a friendly get together, we strive to exceed all of your expectations. Contact us to check out our restaurant hours or inquire about an event at The Marine Room and make your reservations at the best restaurant in San Diego. Join our email club today to be in the know of everything happening at The Marine Room and to get all of our specials sent directly to your inbox.